Baby sitter video. Too insipid for adults to watch, although the amazing mouse effects will come across just as well on the small screen. Fans of "Stuart Little," the classic E. B. 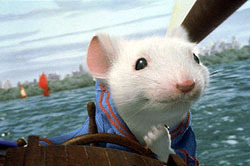 White's children's book about a congenial little mouse with a wind-up red roadster, would be wise to avoid "Stuart Little," the mostly in-name-only big screen adaptation featuring Michael J. Fox's voice emanating from a computer-animated Stuart. Nearly everything delightful about the book is erased or painted over here with near-plotless kiddie fare, predictably zany adventures and deliberately ham-fisted acting from a wildly talented cast (Geena Davis, Hugh Laurie, Jeffrey Jones, Allyce Beasley, Estelle Getty, Julia Sweeney), entirely wasted on a Saturday morning cartoon script. Ironically co-written by M. Night Shyamalan (the writer-director of "The Sixth Sense"), the story opens with Mr. and Mrs. Little on their way to an orphanage to pick out a kid for no explored reason. Won over by the home's least likely resident -- a talking mouse named Stuart with a miniature wardrobe and a pithy personality -- they take him home, where his new brother George (Jonathan Lipnicki from "Jerry Maguire") gives him the cold shoulder and the family cat (voiced obnoxiously by Nathan Lane) tries to eat him. Out of nowhere come unrelated episodes about a miniature sailboat race (Stuart steers the skiff after a bully smashes George's remote control) and the cat plotting Stuart's demise through an elaborate scheme -- lifted wholesale from "Annie" -- in which two miscreant mice (Bruno Kirby and Jennifer Tilly) pose as Stuart's real parents in order to turn him over to a bunch of bad apple alley cats. Generic life lessons are, of course, gleaned from each incident. Stuart himself is spectacularly rendered, right down to his whiskers, teeth and shoelaces. My hat is off to the animators. Pity the story couldn't have been something special. Goodness knows the book deserves better.